When a refrigerator is leaking water, it needs to be addressed immediately. Before being able to fix, it is important to first know why the refrigeration is leaking water. There are many causes for a leaking refrigerator. The most common instances are that your water may not be able to reach the drain due to being leveled incorrectly or that the defrost drain is actually clogged. For these cases, any homeowner can implement a DIY fix and stop the leaking pretty easily (see our steps below). Other reasons may include improper installation (for example, the water filter) or damaged equipment such as a cracked drain pain. These issues may require part replacement and professional help. When you see water under a refrigerator, check the front legs. 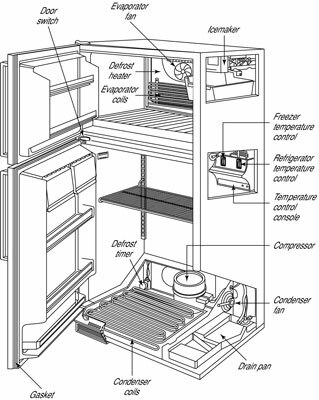 Water (actually condensation) is supposed to run from inside the refrigerator into a drain hole, and then into a drip pan underneath, where it evaporates. If the refrigerator is completely level or tipped slightly forward, the water may not be able to flow into the drain. All you have to do to get it working is to adjust the front legs so that the refrigerator tips back slightly. That tilt also makes the door swing closed after you turn away from the refrigerator. Have a helper tip the fridge slightly back so you can get under it. Use a level on the front edge of the refrigerator to make sure the legs are even. Partially open the door and walk away. It should close by itself now. Tip the refrigerator only slightly because it is designed to be (almost) level, and tilting it too much might cause a problem somewhere else. If you can’t adjust the legs, put a shim under each of them, about 1/8 inch thick at the wide edge. Locate the drain tubes at the rear of the refrigerator or freezer. Push a small plastic tube or a pipe cleaner through the tubes. Pour a mild solution of soapy water and ammonia down the drain tube to kill bacteria. If you have a turkey baster or syringe, use it to squeeze water into the hole. Check the drain pan under the refrigerator, on the left side, by removing the front grill. If the soapy water hasn’t drained into it, you still have a problem. Go to Step 6. Working inside the refrigerator, push the tube or pipe cleaner into and through the drain tube. Flush the hole with water again. You should now find water in the pan. If you do, don’t worry; it evaporates. You can also have water problems if you keep the refrigerator in an unheated garage, porch, or basement. As heat from the motor flows across the cold exterior, it condenses and water forms, dripping onto the floor. All you need to do is put a space heater nearby, and if there’s no more water, you know condensation’s the problem. Solve the problem permanently by moving the refrigerator to a warmer place.